I live near Vista Valley and I had no idea there was a resort within the subdivision. I'm talking about the Villa Sto. Nino resort which is located at the far end of Vista Valley Executive Village. The resort has both recreational and sports facilities. You can play billiards, basketball and go for a swim in their pool. As for recreation, a sound system with videoke is available as well as 2 gazebos, a fountain and a garden good enough to fit receptions for birthdays, debuts and weddings. The have ample parking space and a standby generator. Villa Sto. Nino also has 2 air-conditioned VIP lounges with a powder room for the celebrants use for retouching, dressing or photo and video coverage. The garden has a huge semi-transparent green ceiling which makes it usable regardless of weather conditions. For Marikenos, you don't have to go out of town just to go to a resort, and you don't have to go to hotel to hold an event. Villa Sto. Nino is located at Lot 30, Block 4 Macapagal Street, Vista Valley Executive Village, Sto. Nino. Visit http://villastonino.com for more details or contact them at (632) 682-5266 (632) 682-6448. 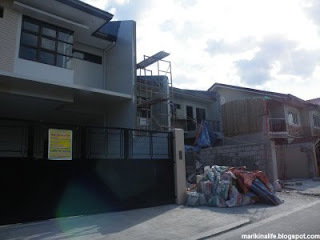 Crystal Homes is offering a house and lot for sale within Vista Valley along Sumulong Highway, Barangay Sto. Nino. The lot is located at the corner of M.A. 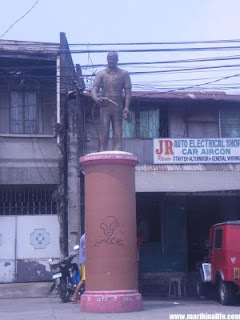 Roxas Cor. J.P. Laurel Sts., Phase 1 Vista Valley. From the gate, go straight along the main road and turn right at the end. Cordillera Coffee is another specialty coffee shop located at the Marikina Riverbanks. Being named after the Cordillera mountain ridge leading up to the north, this cafe serves coffee grounded from beans harvested from the north Luzon region. Aside from the regular, lattes, mochas and common blends, they also serve exotic beverages like Civet Coffee (D'kapetismusang) which is a rich chocolatey aroma in a one-of-a-kind brew. The coffee shop goes further by offering full meals as well. Their menu is also influenced by the Cordilleras. Pancit Cordillera for example is pancit cabagan with vegetables, chicken liver and native longanisa topped with crispy garlic bits and chicharon. Cordillera Risotto is served with mountain rice mixed with mushroom bechamel sauce and native longanisa bits, topped with mushrooms and parmesan cheese. They also serve cakes and cupcakes to complement your coffee. 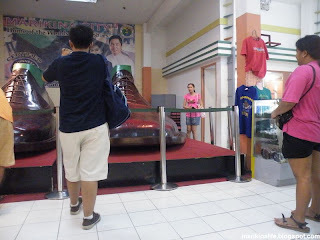 The Largest Shoes in the World are located in Marikina City ! Officially recognized and certified by the Guinness Book Of World Records, the pair of shoes measurre 529 centimeter(5.29 meters)long measures 237 centimeters(2.37 meters)width and is made of genuine leather. The upper lining it took 77 days to finish(August 5, 2002 to October 21,2002). Due to its sheer size, it was built at the Marikina Sports Center. Upcon completion, the shoes were displayed at the entrance of the Sports Center, then later transferred to the Marikina Riverbanks where it is located until present. The shoes can be worn by a person with a height of 125 feet can fit 30 people inside the shoes can produce 250 pairs of regular shoes from the materials used. You can see the shoes for yourselves by visiting the Marikina Riverbanks Center. It's at the far end of the mall and beside several shoes on display for sale. There are also some souvenirs you can buy like t-shirts and keychains. At the foot of one of the hills of Marikina Heights is the World Of Butterflies. This elongated structure houses a botanical garden and breeding area for butterflies. When you enter, you'll be greeted by butterflies freely roaming around the area. A trail leads you to a landscaped garden where you can get a glimpse of butterflies flying from branch to branch and bush to bush. If you're lucky, a butterfly may even land on your head or hand if you hold it out like a branch. There are butterflies of different shapes, sizes and colors. Aside from the full-grown butterflies, there are also several cages with catterpillars who are in different stages of their metaporphoses in eventually becoming a butterfly. Here you'll see the catterpillars slowly crawling on leaves eating them as source of nutrition. If you wish to learn more about the entire life cycle of a butterfly, there is a viewing room on the 2nd floor where you can watch an educational audio-video documentary of the butterfly. The place is also decorated with huge artificial butterflies placed on the walls and 2 lifesize butterfly mascots at the entrance. 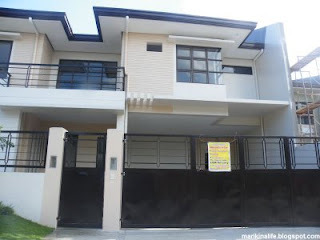 The World of Butterflies is located at the corner of Champagnat and Gen. Ordonez Streets, Barangay Marikina Heights and right beside Marikina Heights National High School. They're open every day from 8am-5pm (excluding holidays). Entrance fee is P20. for Marikina residents and senior citizens and P40. for non-residents. For more info, call 941-3747. E.nopi Math and English programs are now being offered at the 2nd floor of C & B Mall, at the Liwasang Kalayaan Road in Marikina Heights. E.nopi English enhanced student's language and literay skills through listening, speaking, reading (comprehension) and writing (composition) exercises. The primary aim of standard, school-based educational systems is to provide a general base of knowledge and skills that all students should possess. The E.nopi program supplements this fundamental learning experience by preparing students for school classes and helping them to achieve maximum benefit from their academic practices. E.nopi encourages students to acquire self-motivation, independence, and proactive learning methods by placing them at the center of all learning activities. In 1969, former president Ferdinand Marcos spearheaded a project giving SSS members an opportunity to own their own houses with long-term but convenient plans. The idea was to offer 500 SSS members a slot for the opportunity to avail of the low-cost housing via raffle. The area where these houses would be located was to be known as SSS Village. My mom, which was then looking for a house to own, joined the raffle and luckily won a slot. And she, along with the other 499 lucky draws all became the first homeowners of this brand new village. Since the village didn't have any street names to begin with, all the houses were addressed by lot and block numbers. Since it was confusing, the homeowners association decided to hold a meeting and brainstorm for possible street name themes. One of the proposed themes were Filipino song names, like Sarunbanggi. Fortunately, it didn't receive such a favorable response due to its difficulty in coming up with several names not to mention difficult ones. The theme which was finally agreed on were colors. And so, up to this day, Phase 1 and 2 of SSS Village all comprise of colorful street names. Aquamarine, Tangerine, Olive, Crimson, Peach, Gold, White, Purple, Azure, Scarlet and Russet are just a few of the names within SSS Village. 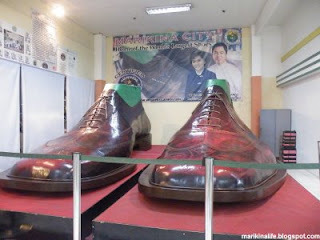 It's just fitting that Marikina City, being popularly known as the shoe capital of the Philippines , houses the Shoe Museum. Where else could you find an annual Sapatos Festival (Sept. 9), a fully motorized running high heel, giant shoes in the middle of the river and home of the world's largest shoes (Marikina Riverbanks) than in Marikina ! Located along JP. Rizal St. and just across the Our Lady of the Abandoned Church is the Shoe Museum. 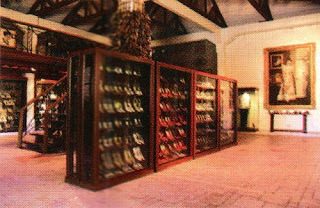 The museum holds shoes of several famous people including a pair of shoes from each president of the Philippines in chronological order. Other shoes note worthing are those of celebrities, ambassadors, political figures and even traditional shoes from several countries. On the 2nd floor, you'll read history about shoe making including life-size mannequins depicting the art of shoemaking. 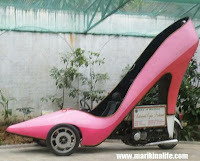 You'll also find some unusual shoe sizes like one being 3 feet long. The main bulk of shoes on display was contribued by former first lady of the Philippines Imelda Marcos... 749 pairs to be exact. You'll see all different kinds of shoes she owned for different occasions. Shoes both made in Marikina and made abroad with different brands, styles, shapes and colors are all on display. A huge portrait of Imelda is also hanging above serving as a mini-shrine for her shoe collection below. Entrace to the Museum is P20. for Marikina residents and P40. for non-residents. Unfortunately, picture and video taking inside the museum is not allowed. The museum is open from Mondays through Saturdays from 9am till 5pm. Update: We've been informed that the new entrance fee is P50. There's a new pizza place in Marikina and it's offering what they call "the biggest, tastiest, best pizza in the planet". Of course that's a real bold statement for a new pizzeria. 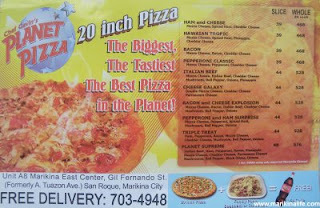 But their tagline is apt with their name, "Chef Gavin's Planet Pizza". I've known the other popular pizza parlors like Shakeys, Pizza Hut, Dominos, Sbarro and Yellow Cab to have 18" sized pizzas as their biggest size. Well, Planet Pizza goes 2 inches longer by offering a whopping 20" pizza. A couple of the flavors they offer are ham and cheese, hawaian tropic, bacon, pepperoni classic, italian beef, cheese galaxy, bacon and cheese explosion, pepperoni and ham surprise and triple treat. The also have their special planet supreme pizza which includes italian beef, ham, pepperoni, bacon, pineapple, mozza cheese, cheddar cheese, parmessan cheese, mushrooms, bell pepper, black olives and onions. Now that's a lot of toppings. I bet you'll get a huge dose of each topping covering such a huge pizza. 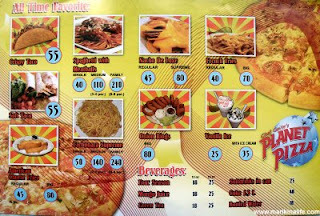 Aside from pizzas, they also offer soft and crispy tacos, spaghetti with meatballs, nachos, french fries and american cheese fries, carbonara supreme and onion rings. I found their dessert to be witty carrying the name of Vanilla Ice (with ice cream). The Celebrity of the Month for May at the Riverbanks Center are the Gigger Boys. Robi Domingo of Pinoy Big Brother Teen Edition Season 2 was the Riverbanks Center celebrity of the month last March 2009. This month, he is joined by his fellow teen idols, the Gigger Boys. They are composed of Aaron Villaflor, Robi Domingo, AJ Perez, Dino Imperial & Chris Gutierrez. They'll be performing at the Atrium on May 24, Sunday from 5pm-6pm. 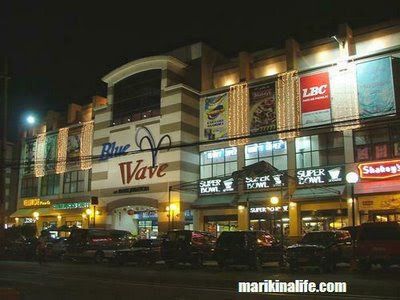 Bluewave Marikina bids farewell to Superbowl, which recently closed their restaurant last May 17, 2009. Superbowl, which used to occupy the ground floor between Starbucks and Shakeys, posted their farewell notice to the public thanking the people for their support and to visit their other branches. In contrast, some new stores in Marikina will be opening very soon. At the Marikina Riverbanks Center, soon to open are Asian Citident Medical and Dental Supply Store, Hehers Merchandising, & Reli Tours and Travel Agency. Burger King is now open at the ground floor of SM City Marikina. And the newest pizza parlor along Gil Fernando Ave. is Chef Gavin's Planet Pizza which boasts of their huge 20 inch pizzas. Be sure to check out the new stores and restaurants in Marikina. Dutch Marikina is part of Industrial Valley and where the stretch of the Marikina Riverbanks road leading to C5 depicts a long colorful facade of housefronts which are similar to that of the Dutch, hence its name. Christian Bautista's MTV for his love song "Kalan Pa Ma'y Ikaw" was shot entirely in Marikina with the colorful facades clearly shown in the background. The video shows Christian walking in front of the houses interacting with the people while singing. 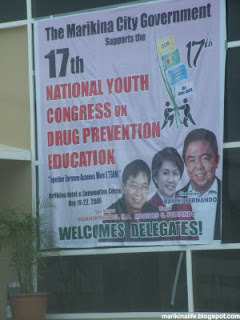 The Marikina City Government supports the 17th National Young Congress on Drug Prevention Education. The delegates were welcomed at the Marikina Hotel and Convention Center. The 4 day event will be from May 19 - 22, 2009. A motorcade went around Marikina to announce the said event. To all delegates, enjoy your stay in Marikina ! 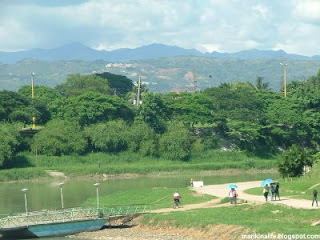 Marikina Riverbanks with the hills of Parang in the background. There are a lot of restaurants that specialize in chicken. There's the ever-popular Max's, there's Kenny Rogers Roasters named after the famous country singer, there's the likes of Mang Inasal, Chicken Inasal and Bacolod Chicken that specialize in inasal. Then there's Andoks, Baliwag and Sr. Pedros that specialize in lechon manok. As for Marikina, there's a homegrown restaurant that is proud to mention its roots that it included it in it's restaurant's name: Johnny's Chicken - The Fried of Marikina. Their specialty of course, is chicken. You can't compare it with other brands and flavors of chicken cause it has it's own unique taste. Aside from serving whole chickens, you can sample a piece with their various meals which include rice and drinks. I personally like the taste of their chicken. It's not as big as other restaurant servings but the taste is justifiable enough to order 2nds. I'd recommend getting a 2 piece chicken or 1/2 chicken for your stomach's enjoyment. 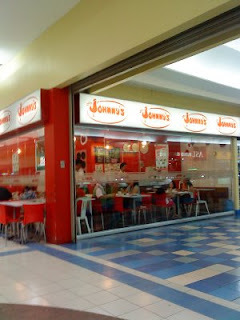 Johnny's has 3 branches up to date: right within Marikina Public Market along W. Paz St., (beside Krung Thai), one inside the Marikina Riverbanks Mall and one in Pasig City at the corner of Amang Rodriguez Ave. and Benito Soliven Ave. Taste the Fried of Marikina, Johnny's Chicken. Mr. Softy, one of the popular soft-served ice creams around is based in Marikina City. 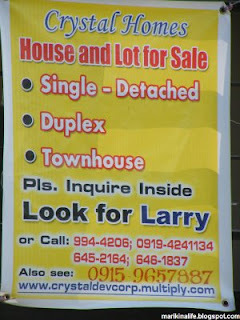 Their office is located along Katipunan Road near the intersection leading to Strip 70. You won't be able to buy ice cream there since it's an office. But you could inquire there if you want to franchise or conduct business with them. 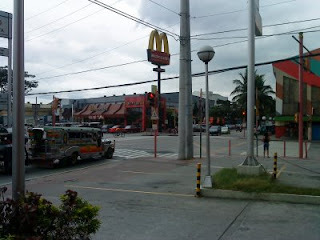 One of the branches of McDonalds in Marikina is right beside the Marikina Sports Center. When McDonalds was first built here, a new street between it and the Sports Center was formed. Since the new street that sandwiched the two establishments didn't have any name, it was formally named "McDonald Avenue". Since then, this has been one of the busiest streets in Marikina. This road connects Sumulong Highway and the City Hall of Marikina. During the mornings, people who go in and out of the Sports Center for their morning exercises around the track and field, pass through this street as the entrance is situated in front of this street. During the day, several passenger tricycles and city vehicles pass by as well. 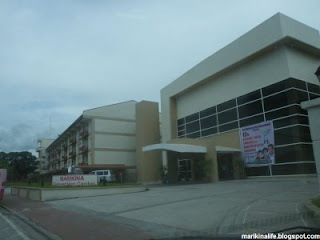 During major events like concerts, prayer rallies and sports competitions held inside the Marikina Sports Center, this road serves as the entrance to the venue. 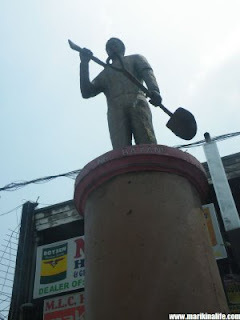 The Marikina doll museum is also located along this road. McDonalds also has a separate venue at the back good for kiddie parties and seminars. 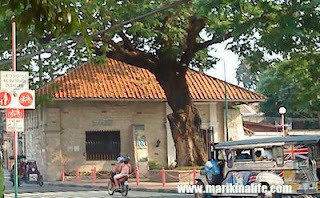 The road that took the name of a fastfood franchise is now part of Marikina's map. St. Paul of the Cross Parish in SSS Village has been actively helping out the Sto. Domingo Parish, Talim Island, Binangonan Rizal. During Sunday mass, representatives of the Parish come to SSS Village to spread awareness of their parish and current state. They sell fishes which is part of the livelihood of the people in Talim Island. 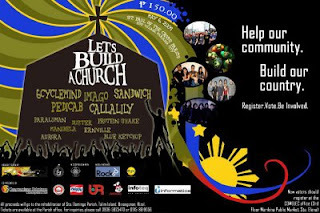 This time, with the support of Darwin Hernandez of Soupstar Entertainment, a fund raiser entitled "Let's Build A Church" will be held on May 6, 2009 at the St. Paul of the Cross church grounds. Darwin, also a resident and part of the parish, will be organizing the event and bringing in the popular rock bands that Soupstar Entertainment manages. 6cyclemind, Imago, Sandwich, Pedicab, Callalily, Paraluman, Duster, Protein Shake, Manibela, Ernville, Aurora and Blue Ketchup are all set to perform in this concert for a good cause. Tickets are sold at P150. each. All proceeds will go to the rehabilitation of Sto. Domingo Parish, Talim Island, Binangonan Rizal. Tickets are available at the Parish office. For inquiries, call 0906-5825470 or 0915-8619056. Biksa Coffee, one of the premium coffee shops in Marikina, is celebrating their 1st anniversary. And as their way of saying thanks, they are offering a 1st anniversay treat to all patrons. From May 1 til May 7, 2009, Biksa Coffee will be giving away 7 prvilege cards each day, 7% discount everyday for 7 days. The 7% discount applies to minimum purchases of P250. and above. If you haven't visited Biksa Coffee, now is the perfect chance to try them out. Biksa Coffee is located at 18 Gil Fernando Avenue corder Dragon Street (just behind BDO).